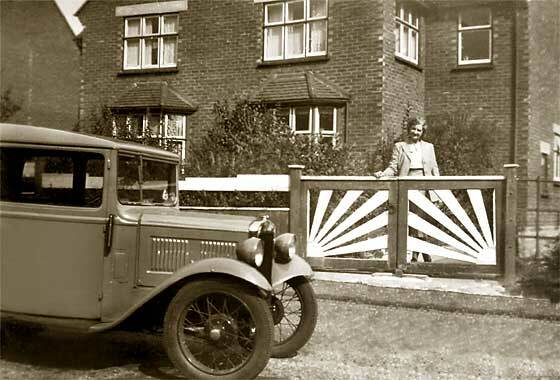 While recently browsing through vintage car websites came across the East Riding Vintage Motor Vehicle Page on which was an unidentified vehicle photo from the collection of Bill Melander (UK). Can advise the car is cca 1895 Duryea which was built by brothers, J. Frank and Charles E. Duryea in Springfield, Massachusetts, USA. 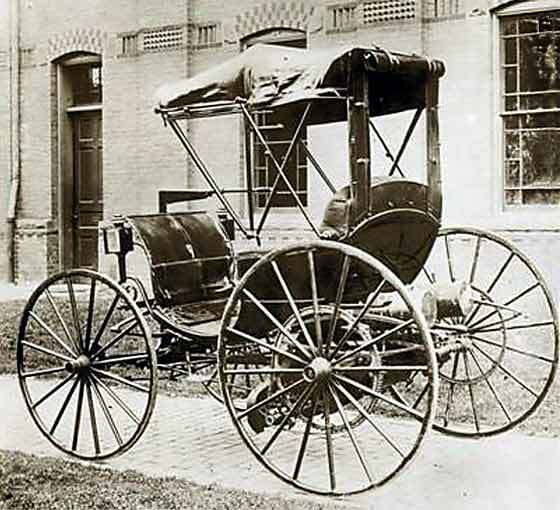 An 1895 Duryea won America's first motor race and two cars apparently came to the UK on the London to Brighton Emancipation run on the 14th November 1896. Fascinating set of photographs received from Mrs. Joan Green from Lancashire (UK). They are all from an album discovered in her late great aunt's loft. Being into family history she was hoping it was from her family from Lancashire, but they all seem to be around London and the Thames so the album may have been in the loft when my aunt moved into the house. The name associated with the album is Allvey. This rather fabulous machine is a French cca 1898 Decauville Voiturette. Another from the fascinating set of photographs received from Mrs. Joan Green from Lancashire (UK). They are all from an album discovered in her late great aunt's loft. The name associated with the album is Allvey. I guess they must have been quite a well off family because not only did they have a number of cars at the turn of the century but all the cars were quality. 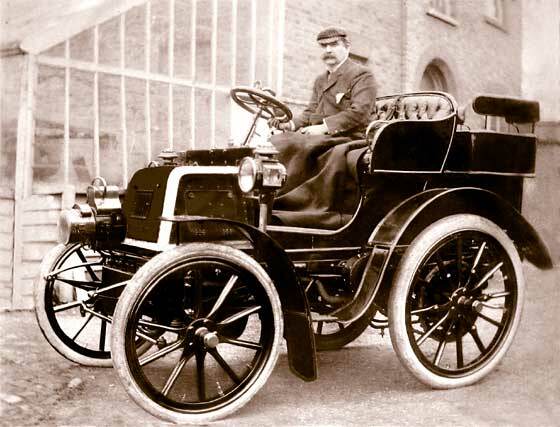 This impressive vehicle is a cca 1899 Daimler Tonneau. Prince of Wales (Edward VII) had one in 1900. Another from the fascinating set of photographs received from Mrs. Joan Green from Lancashire (UK). This suggests that the Allvey family were not only well off, but technically competent. 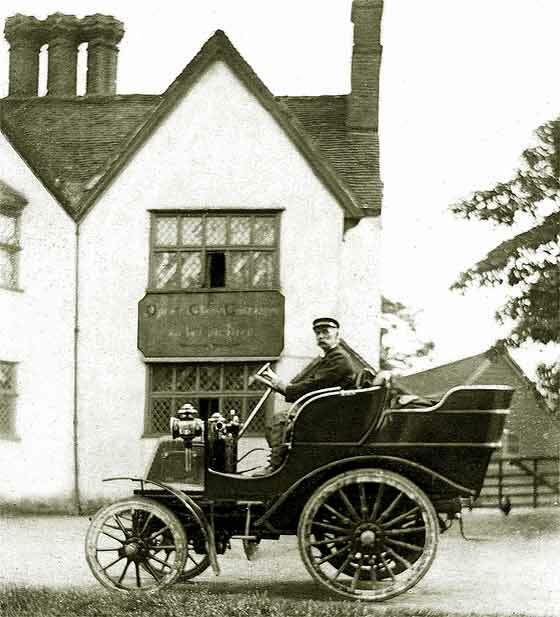 The car shown is, and has been confirmed by my friend Jim Merrick of the Stanley Museum in USA, as being an American cca 1900 Locomobile Locosurrey. These were steam cars. It is interesting to note that the front of the car is fitted with a condensing radiator which was mandatory for UK market. 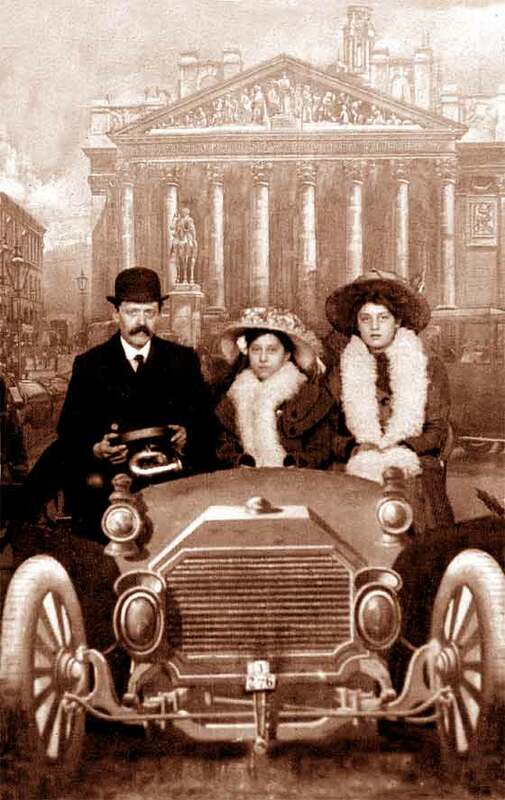 Two Photos received from Yvonne Tindall (UK) who had recently been given these photos of her Great Grandfather and told that these cars are possibly Daimlers. She wondered if we could identify them or have any information on these cars. 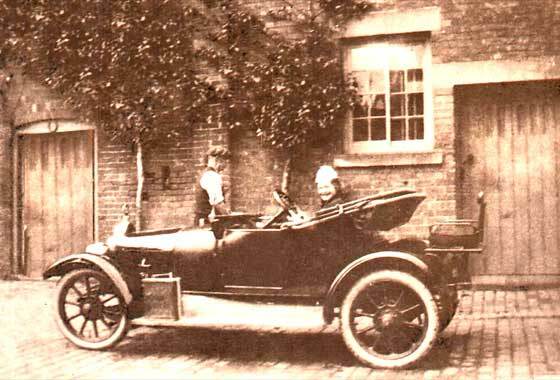 She advises that her Great Grandfather was given this car by Lord Whitbread being the skipper of his yacht. We can confirm that it is indeed a British cca 1900 Daimler 6HP. As there is no registration, or is pre-registration, we cannot check if it survived. Another from the fascinating set of photographs received from Mrs. Joan Green from Lancashire (UK). This carries on to confirm that the Allvey family were either very well off or perhaps involved in the posh end of the motor trade. This rather magnificent car is a cca 1903 Daimler Phaeton, either 14 or 22. Interesting to note that the sides of the radiator carry the air cooled fins which were later to move with the radiator to the top and become the famous fluted Daimler trade mark. We also get some amusing ones. Enquiry received from Tony Randall (UK) saying: " Attached is a photo of my G. Grandfather with his two daughters. The car is real. I cannot be sure if the backdrop is real or part of a studio outfit. The car reg is J276. I have no idea of the make or age, although somewhere between 1902 and 1908 would fit." Regret the whole photo of the Royal Exchange in London is a backdrop. The car is not real, numberplate is wrong and J reg is from Durham cca 1905. Second of the Photos received from Yvonne Tindall (UK) showing her Great Grandfather, Charles William Moon. Her Great Grandfather was skipper of Lord Whitbread’s yacht and bought into a syndicate which built yachts in Nova Scotia and sailed them to England to sell once they were broken in. She understands that this made CW Moon’s fortune allowing him to commission the larger car, having been given the smaller. 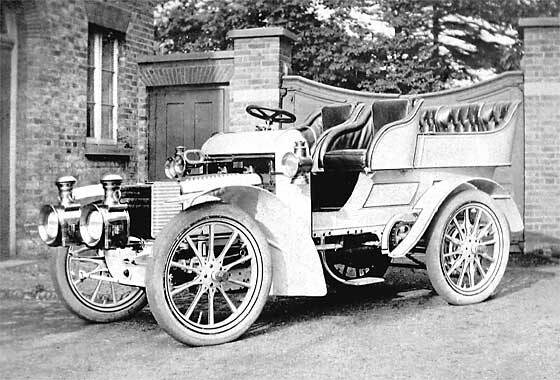 This car is also a British cca 1904/5 Daimler, probably a 28/36. Lovely period photo received from Emeritus Professor Alan Davison of Newcastle University (UK) working on a local history project and has been given a photo of a car that is said to be only the third in Morpeth. The owner was an architect called C.F. Murphy but they would really like to get the date and make. Car has a Northumberland registration but no records to date accurately. 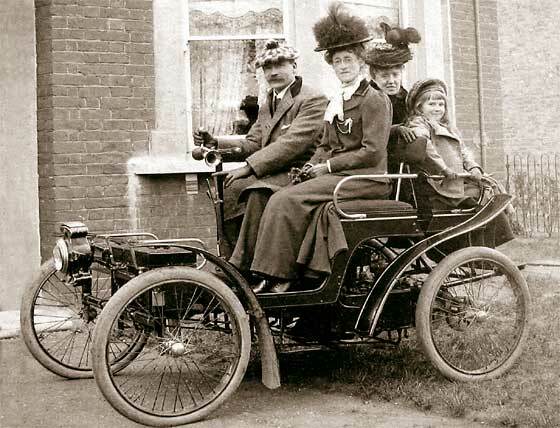 The car is cca 1907 Rover 8HP with Dickey, and so are the fashions. Unusual body with a full height door. Photo received from Michael W George (UK) wondering if we can help him identify the Motorcycle on which the DVLA hold no records and that may never have been registered with them. The rider/driver was a successful Engineering factory owner, Herbert G W Newey. He thinks that the flat tank motorcycle sidecar photo was taken in 1910. Our motorcycle expert Geoff Morris has identified the motorcycle a 1910/12 Humber Combination. H 7673 was a Middlesec CC registration. Another photo received from Bob Kellock (UK) which was found in a family album. The car could have belonged to his grandfather who was known as being an early motoring enthusiast. He had a Swift and a Hupmobile. Bob's uneducated guess is that this car is a Crossley - the little girl could be his mother. Sorry wrong again, on the car, so hopefully the guess is right on the mother. The round bonnet is indicative of a cca 1912 Riley, possibly 10/12. Very pretty car and child. Our Dutch correspondent Fer Cools (Holland) who often sends us very interesting photographs, provided us with this one of a car at a railway crossing near the town of Pey. We are pretty sure this is a German cca 1914 Adler, possibly a 12/30. 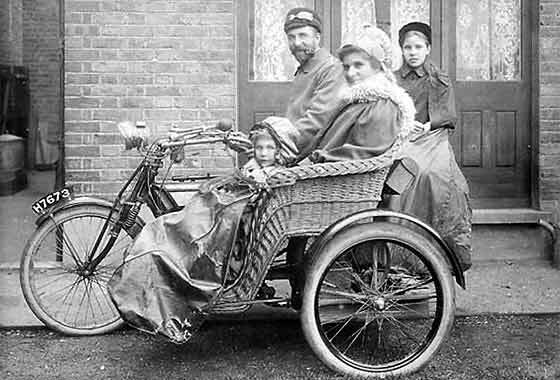 Adler (meaning Eagle) commenced in 1853 by making bicycles, wire wheels and typewriters. 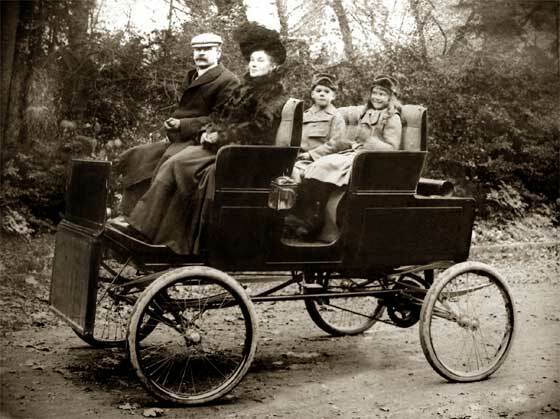 Cars commenced in Frankfurt 1900 using De Dion engines. Well into racing by 1914, 6000 employees by 1928. Motorbikes later, and typewriters / copiers today. 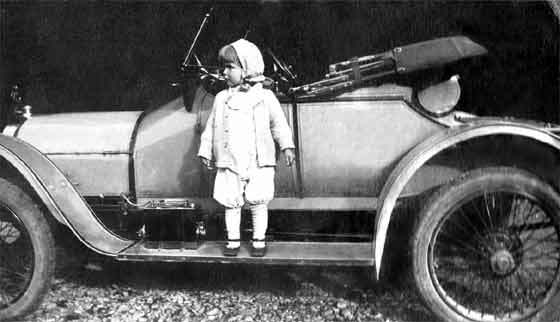 Lovely portrait photo received from Louise Udall-Waring (UK) dating to 1918 that has an ancestor sitting on a car front. She was curious about the model and make of car. We felt that we knew the make so contacted Malcolm Asquith of the Crossley Register who confirmed the model. This car is a cca 1914 Crossley 20/25. Crossley were much into supplying the WW1 military, primarily the Royal Flying Corps, but also the army, with staff cars, ambulances, light trucks and light tenders. Photo received from Bob Kellock (UK) which was found in a family album. 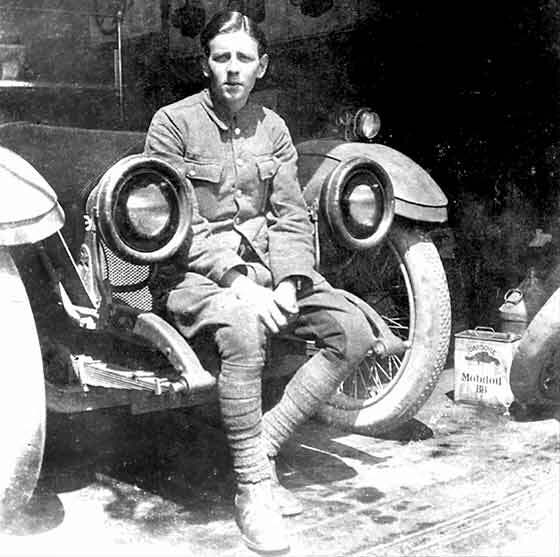 The car could have belonged to his grandfather who was known as being an early motoring enthusiast. The original pic is tiny which accounts for the lack of clarity. He also didnt think he would have fancied riding in the rear "dickey seat"! He would be interested to learn anything about it. The car is a cca 1914 Calcott 10.5HP Light Car, 1460cc four, made 1913-1917, bodied by others. Radiator similar to Standard. Photo received from Juha Kaitanen from Turku (Finland) requesting identification and asking if it was a Mercedes. Not really. The body is the popular 'Tulip' type body made by many Austrian and German companies 1910 to 1920. My thoughts were Austrian because the two little sub lights below the main headlamps. Puch Alpenwagen had similar radiator features. Or Steyr, Austro-Daimler or Austro-Fiat who made taxis. Our Bryan Goodman suggested it was a German Duerkopp. Photo from Ken Tate (UK) trying to find info on "Eric Campbell" cars and found ours on Help Page 9. 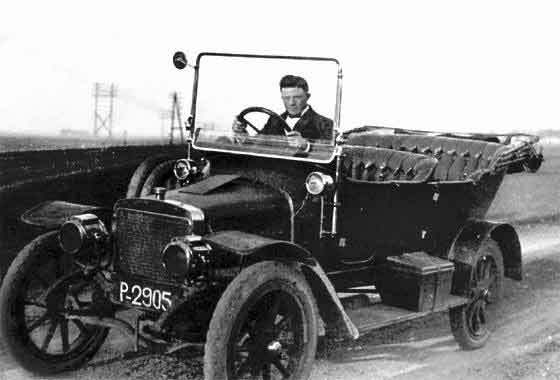 This prompted him to send photo of Grandfather's car, a politician, taken at South Shields cca 1920. EC cars were made 1919-21 and later by Vulcan 1922-26. Coventry Simplex engines, 3 speed gears, ally bodies, assembled at the Handley Page aircraft factory in Cricklewood. 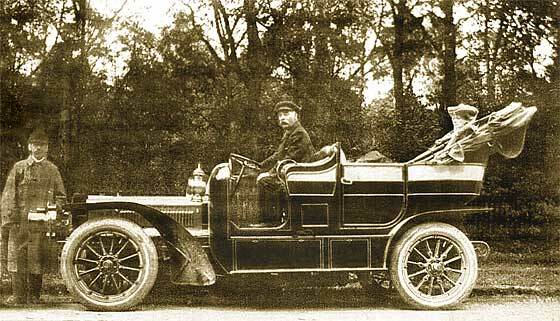 Sporting programme including two cars in 1919 Targa Florio caused financial problems. About 500 cars made. Auto-political enquiry from Ian Robertson (Vietnam), interested in Crossleys and Irish Civil War, in the form of a photo showing Michael Collins the Commander of the Irish Free State Army and Emmet Dalton, one of his Generals, outside a hotel in Bandon, Co. Cork on the day Collins was assassinated. Before we could tell him it was not a Crossley he had identified that this was the very rare Leyland Eight. 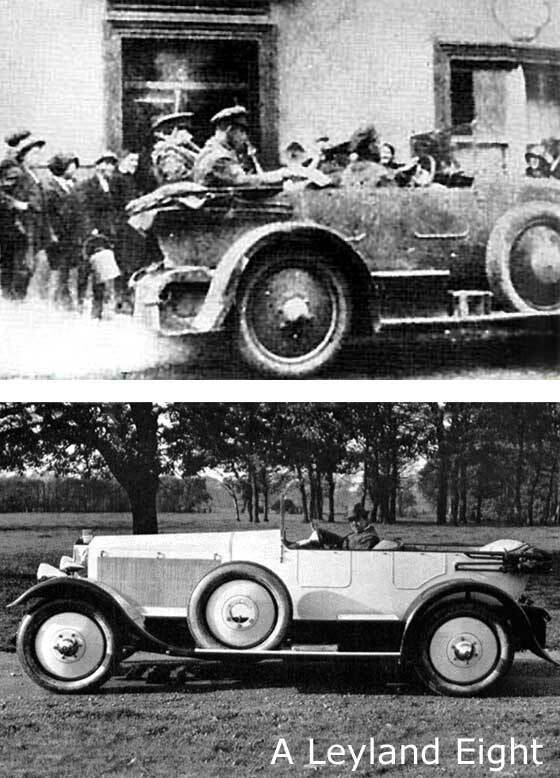 Only about 15 cars were built and were compared to the Rolls Royce. One survives. Some people really like to make our life hard. 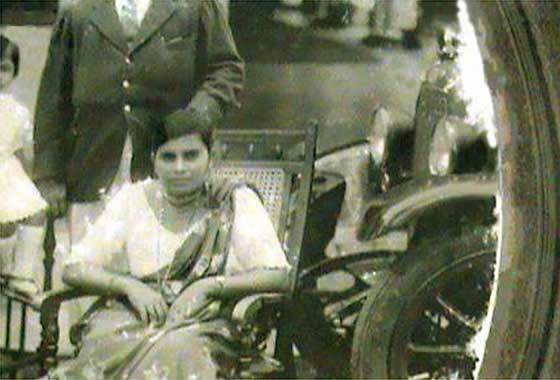 Rod Cuff of Guisborough, Yorkshire (UK) was in on holiday in Sri Lanka and talked to an elderly gentleman who had a photo of his mother in front of a car that he said was imported by his father from Britain into Ceylon in the mid 1920s, and would like to identify it in the memoirs he is writing. 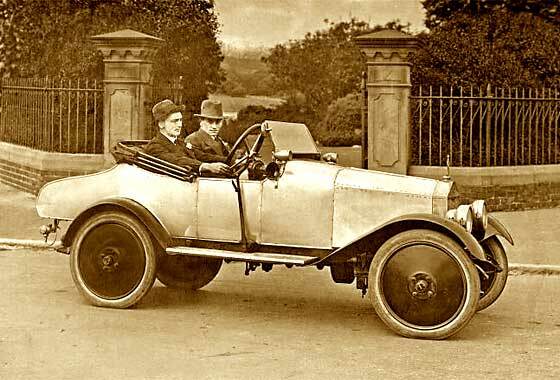 Not much to go on but our Tony Oakes spotted that it was not British but Italian and the side lamps under the headlights confirm it to be cca 1925 FIAT 501 SII. We had an earlier photo from Brian Legg (UK) asking for identification of the car based on just a rear wheel ! We failed, suggesting it may have been the rear of a mid range commercial vehicle, or a charabanc, of the late 1920s. We have now received another photo of the same car showing a bit more of the bodywork. Photo is very grainy and unclear but our Tony Oakes suggested it was probably a Trojan. 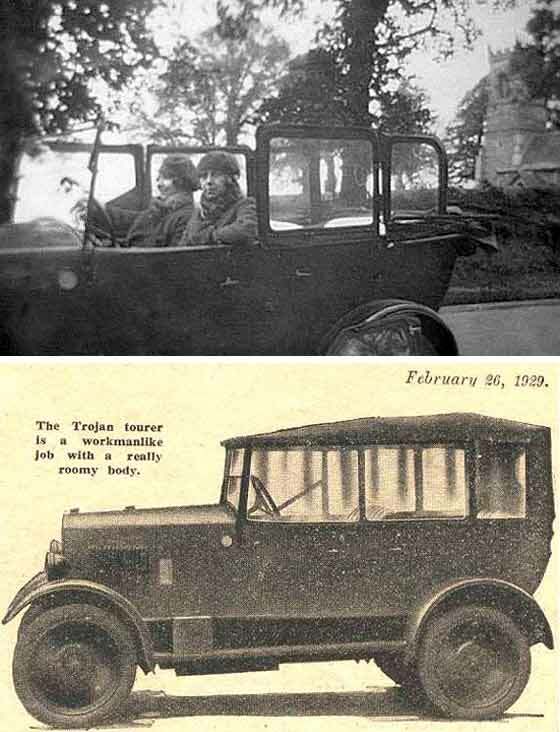 Much diligent searching later, we can confirm that the car is cca 1929 Trojan Tourer. Another photo received from Bob Kellock (UK) which was found in a family album. The car could have belonged to his grandfather who was known as being an early motoring enthusiast. Bob's uneducated guess is that this car is an AJS. Sorry no. 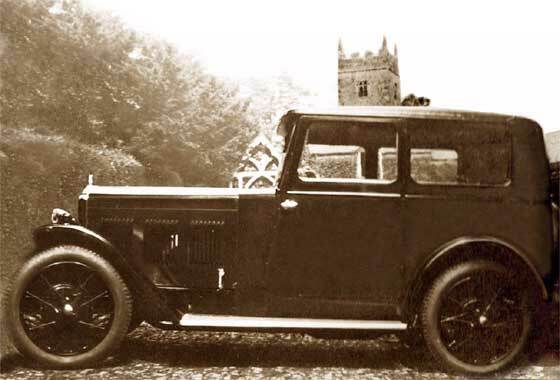 The Car is a cca 1931 Wolseley Hornet made during the William Morris years. Hence similarities to the early MG saloons. Later Morris Motors took over and made upmarket Morrises under the Wolseley brand. Then BMC, and was gone by 1975. Lovely set of photos received from Philippa Elmhirst (UK) from an album made by her parents dating from 1938. They had recently been married in Kenya and decided to cross the Sahara from south to north (Algeria) in the vehicle shown in these photos. Surviving sister seems to remember it was a Talbot. Her father added the trunk for supplies on the mammoth trip. She wants to write this story for her grandchildren. The Car is in fact American, and is a cca 1934 Buick Four Door Sedan. Photo received from John Graves (UK). " Thanks for a wonderful site. Identification of my Grandparents car please. You can use this photo if you wish. Many thanks in anticipation." No registration is visible to provide accurate identification but it can be dated relatively accurately. Exposed trafficator, square door, wider track, longer wheelbase, more knee room; the car is a 1934 Austin Seven Long, 747 cc 7HP. Some 63,000 of this model were made, being saloons, tourers and 2 seaters. 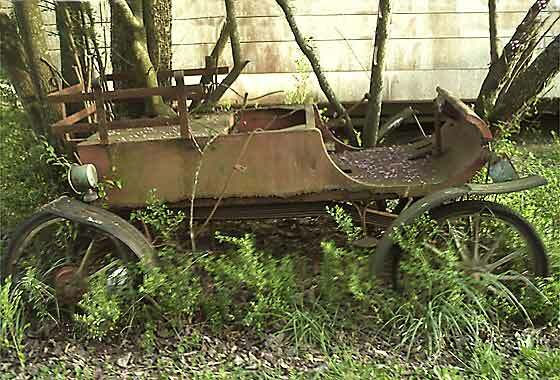 A Series of pictures of a 'rustbucket' received from Tricia Henderson (USA) found while clearing yard of their new home. This would have been practically impossible to identify had I not known the answer !! The vehicle is known as Surrey '03 , and it was a replica kit car made by E W Bliss Company, Canton, Ohio, between 1958 and 1959. 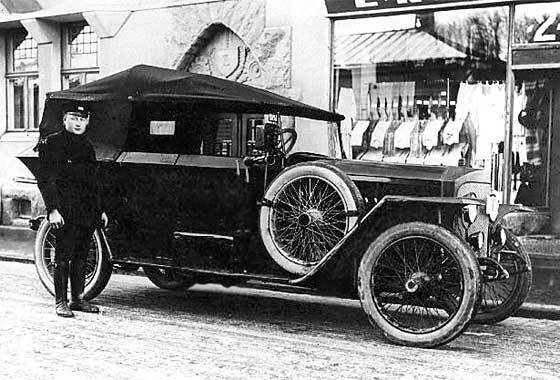 It was based on the 1903 Curved Dash Oldsmobile and fitted with a Cushman scooter engine with current brakes and lighting, -as a kit or assembled. Photo received from Andrew Rusack, Essex, (UK) who is hoping we can help to identify the vintage car make and type. 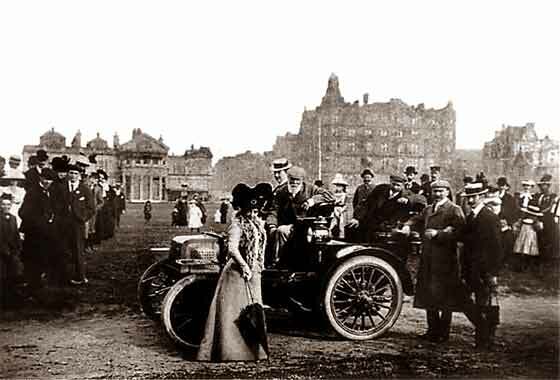 The man in the front passenger seat is the famous golfer Tom Morris. We have tried to get higher resolution photo, but get no reply. We do not have enough to go on because it is the detail that provides the identification. 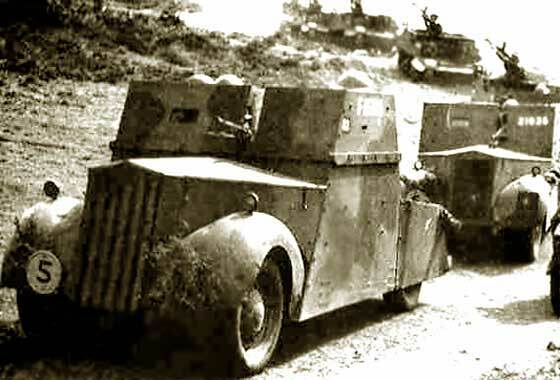 There is a limit on the makes it could be, many of which were connected at the time; Daimler, Panhard, MMC or Napier. Any help much appreciated.